• Is recognizing that you are buying into a negative belief an example of a situation that the light bulb technique can be applied to? • How can we navigate around obstacles? • What actually happens to us when we die? • How can I become a nicer person and not be so easily irritated? • Am I on the right train to the reality I prefer? • How can I overcome doubt? • I was adopted. Can you tell me my birthday? • Could you speak about constructive and destructive wave forms? • How do the positive and negative energies that you speak of relate to the positive and negative poles on magnets? • How can I understand more of the concept of nothingness? • Could you comment on your perspective of collective consciousness? Bashar describes the chess game analogy. • Can you speak more on feeling other’s energies or emotions? • I always thought that I was an alien throughout my life. Could you comment? • Why do I create blind spots in my life? Bashar describers the motivational mechanism. • How can I use my fear of the future to reveal my negative beliefs? • Could you speak on the concept of forgiveness? • How can I help people who are dealing with negative beliefs about death? • How can I overcome challenges in merging my physical and nonphysical experiences? • Could you please explain The Kit of Excitement to me? • Why am I crying so much in my meditations? • Are there limits on my free will? Bashar speaks on destiny. • What is the purpose of fear? Is it related to our survival? • What is actually happening when "the lightbulb" from today’s topic is unscrewed? • Why is my elderly mother still here if she wants to leave so much? • What is the best way to heal the body? • How can I get the best sleep? • Could you elaborate on what you mean when you say "Everything that you experience is your own energy"? • Could you comment on mental illness? 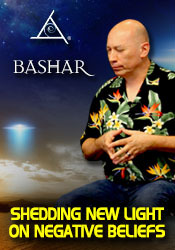 Bashar speaks on multiple personality disorder. • Is vibration the same as emotion? • What role does music play in the evolution of the species? • I am passionate about flower essences. Could you speak more on how they work as healers? • If there is no future does that also mean that there is no past? • How can we rewrite the past as a useful tool? • Can a paper document actually change when we change our past? • What about "difficult" things like the place we were born or the school that you went to? Can those things change to? • How can we have a radically different experience? • What about memories? Are they created in the now? • Could you speak on action? • I've heard you say before to "know thyself" and I have also heard a transmission where you encourage questioners to say that they don’t know. Can you clarify those two ideas? • Could you comment on the idea of protection and permission slips? • How can I redefine the idea of chemtrails? • How can I reconnect my estranged children? • Could you speak on the symbol of Christ’s burning heart? Bashar speaks on what it means that Jesus died for your sins. • Why do you sometimes not answer certain questions? • Could you comment on instantaneous healing? • Could you speak on the hero's journey? • Could you elaborate on Earth being a master class? • Could you comment on the human range of emotionality? • What are thought forms? • Is it possible to continue our lifespan after we fulfill our theme? • Are there other species who prey on humans? • When we attempt to create a certain reality and it doesn't come true, does it mean we don't have enough willpower? • Could you comment more on how we go temporarily out of balance to achieve a higher level? • I saw many orbs at my visit to the crop circles this summer. Can you comment? • Could you speak more about the RH negative blood type? • I just ended an unhealthy relationship. Why did I not attract the version of that person that I wanted? • Did the story of Noah's Arc actually happen? • Was Star Trek's creator Gene Roddenberry contacted? • Are some of the alien species in Star Trek actually accurate? • Who led the Jews out of Egypt? • What have you learned lately from a mistake that you made? • Where do thoughts come from? And which comes first, emotions or thoughts? • Could you speak more the symbology of your family crest? • Does infinite parallel realities mean that any off the wall conspiracy theory that you can imagine is somewhere true? • How do I release the fear of losing a loved one? • Can you share your perspective on the wars going on in higher planes? Bashar discusses human biology and hormones.